I visited Embrasse for the first time a few weeks ago, but that wasn't the first time I'd sampled chef/owner Nicolas Poelaert's food: that happened back in February, at the lunch that he and Provenance chef Michael Ryan prepared for the MFWF media launch. I met Nic at the end of the lunch and we talked about restaurants and his passion for growing heirloom and unusual herbs and vegetables to use in his cooking. Nic's impressive credentials include time cooking with three Michelin star chef Michel Bras at his prestigious, eponymous restaurant in Laguiole, France (also home of everyone's favourite insect-adorned knives), at the original Vue de Monde in Carlton, and at Circa the Prince. His restaurant, Embrasse, opened in early 2009 in the building that was formerly home to Andrew McConnell's Three, One, Two and last September Nic was awarded Young Chef of the Year 2010 by The Age Good Food Guide. 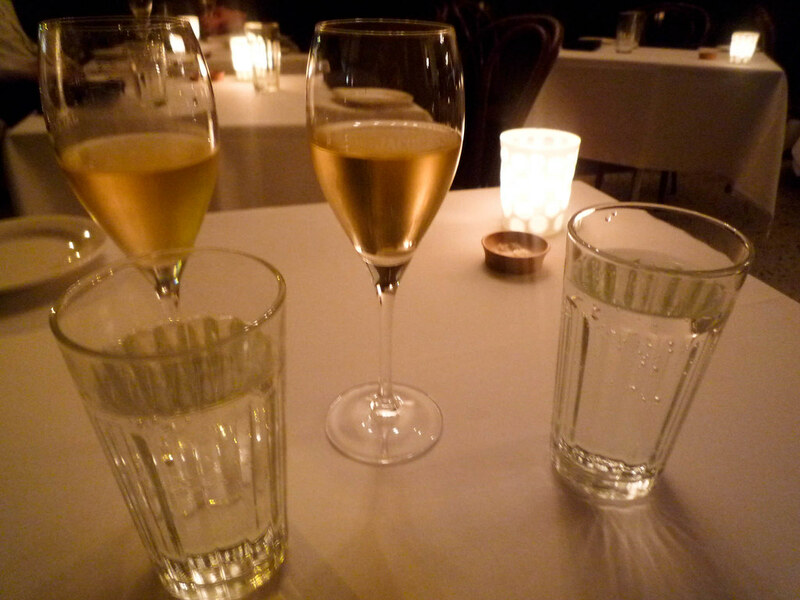 I'd been saving a visit to Embrasse for one of my dinners with the charming A, who I hadn't seen in forever. When I arrived at the restaurant he was already sipping on a glass of bubbly and he immediately ordered one for me, cos that's the kind of guy he is. He's also the kind of guy who, when we are brought the à la carte and degustation ($90/5 course or $120/8 course) menus, decided with a smile that we just had to have the eight course degustation with matching wines. The wines were well selected by Embrasse's accomplished and congenial manager Camm Whiteoak (who was previously working his FOH manager magic at Attica). Confession time: I never visited Three, One, Two (shocking, I know, given I'm such an Andrew McConnell fangirl), so the last time I'd been here was when the building was the restaurant Mrs Jones. 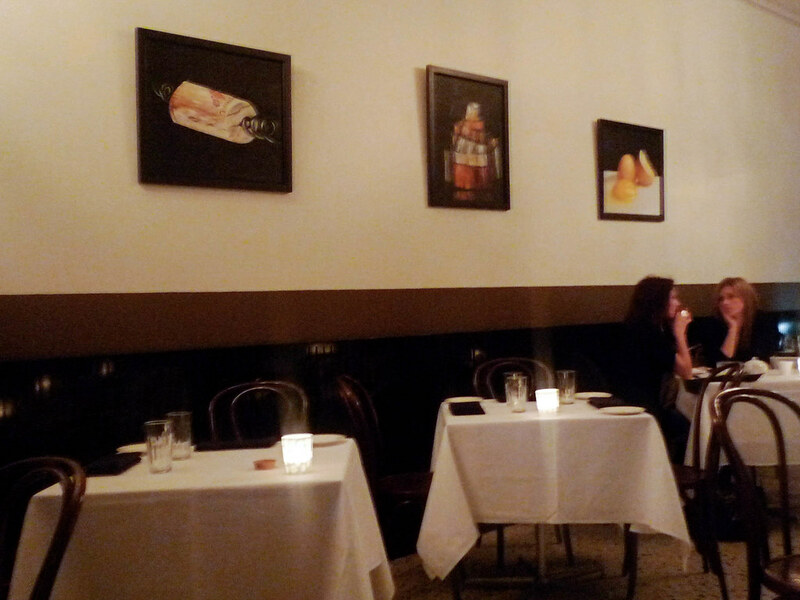 I like the intimacy of the room, and the banquette seating in the front window. 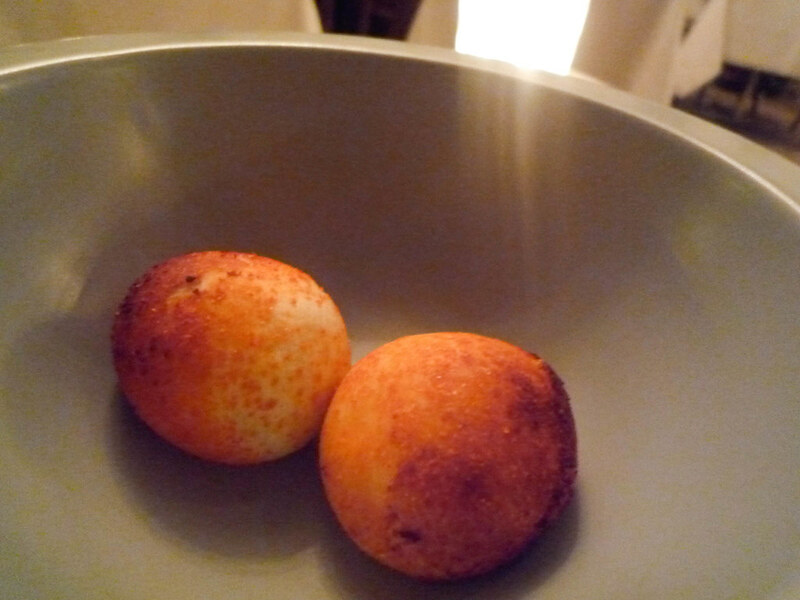 To begin with, we were brought little balls of sweet buttermilk bread (studded with roasted raisins and dusted with red pepper powder) and pairs of cute appetiser spoons, filled with roquefort & apple and kingfish & beetroot jelly respectively. 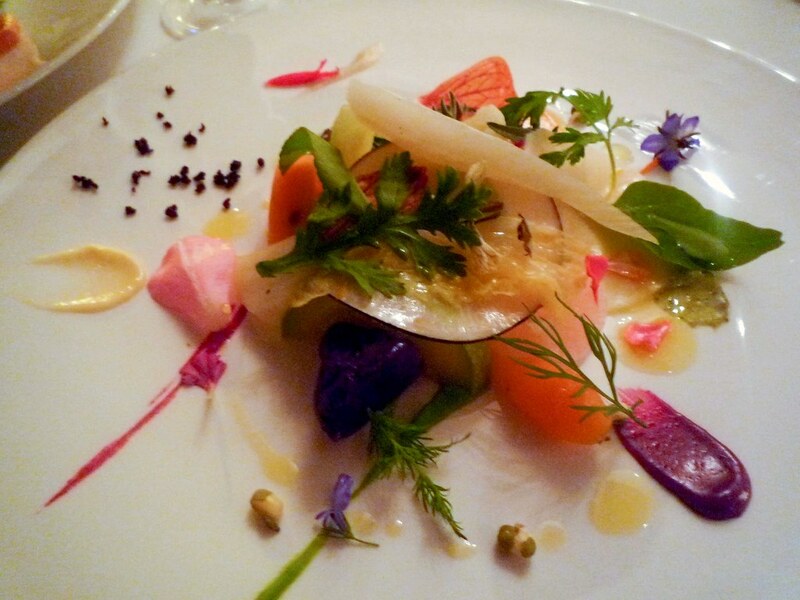 The first dish knocked it out of the park in terms of presentation and subtle flavours: it's a méli-mélo ('mish-mash') of vegetables, emulsions and purées, homegrown herbs and flowers. Almost all of the vegetables, herbs and flowers Nic and his team use are grown in his gardens in Donvale and Warrandyte, and the importance of vegetables in the Embrasse kitchen is declared upfront in the menu's manifesto. The vegetables are blanched with a little salt and then cooked with a dab of butter. There were so many interesting things on the plate, at first I just tasted each paste, crumb and purée on its own before then experimenting with mixing them with other elements (as I like to do with Pierre Roelofs desserts). When you come to dine here, make sure at least one of you orders this dish, cos the vegetables need to be tasted to be believed. 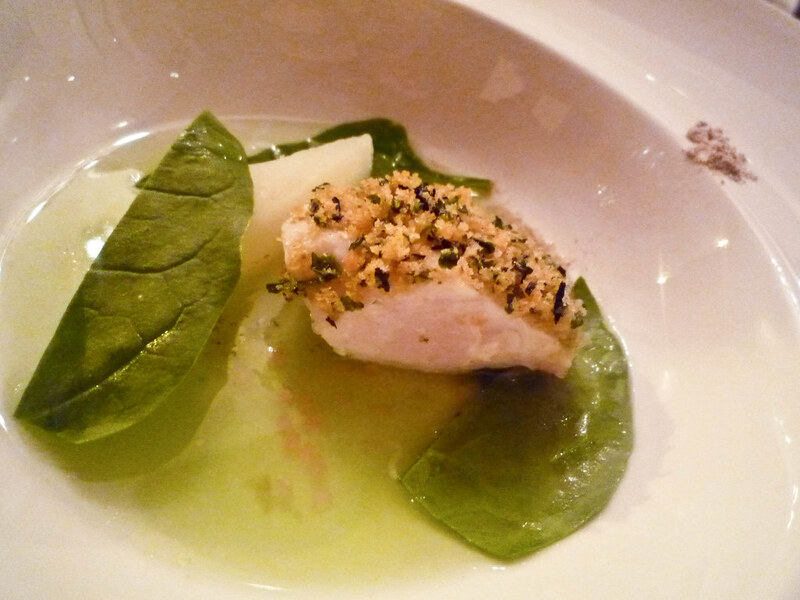 The next dish was kingfish "steamed for just a little bit" (as the menu put it) and topped with panko crumbs and seaweed. It came with spinach leaves, steamed kohlrabi, rosy pearls of fingerlime, warm parsley water poured from a beaker into the bowl, and a pinch of powdered anis on the bowl's lip. 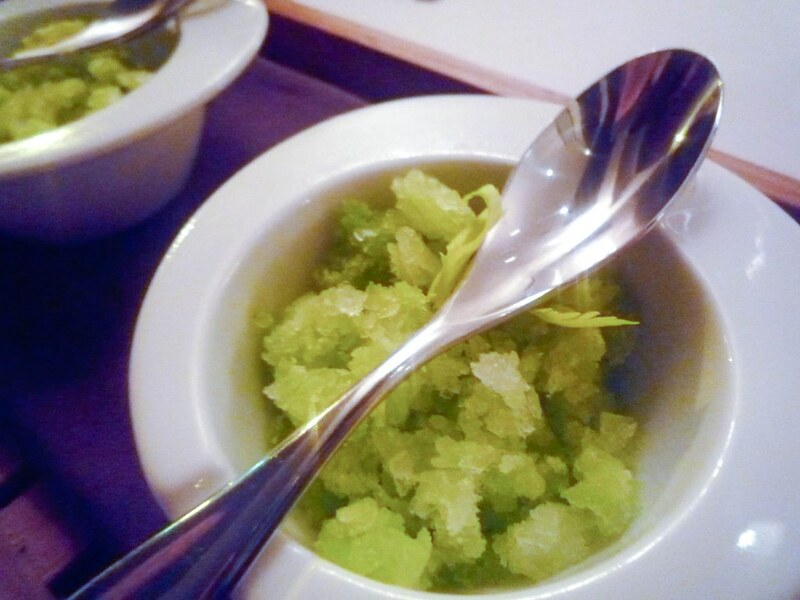 The fingerlime gave the dish a zing and a pep that I really liked. The kingfish was followed by one of Nic's signature dishes, which I'd tried at the MFWF media launch: john dory semi fried and semi steamed, stained with squid ink and served with pink grapefruit and a troupe of Daylesford heirloom beetroots standing at attention on a scrape of burnt carrot purée, which Nic makes in the Thermomix. The burnt carrot purée looks and sounds slightly bizarre, but tastes incredible (the recipe can be found here). The fish was just as moist and tender as I remembered it from last time. And wow wow wow how gorgeous was the presentation of the pigeon?! 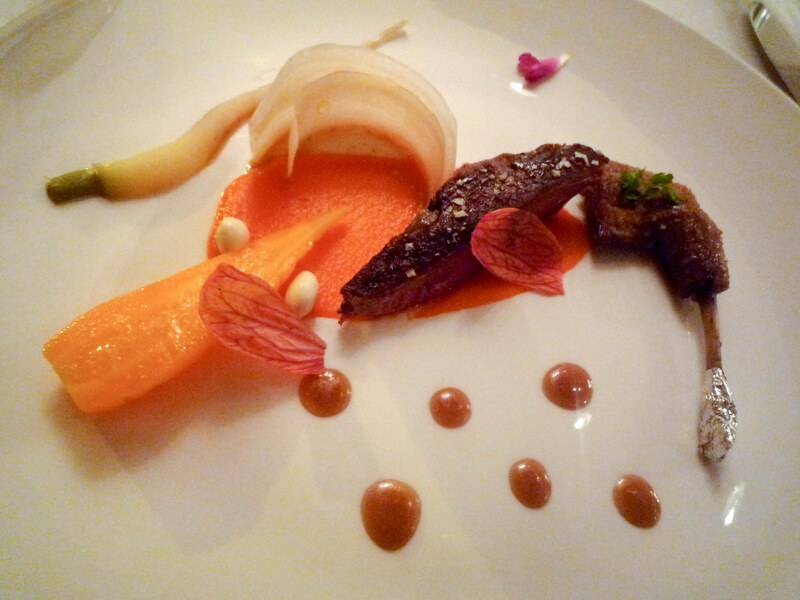 Bendigo pigeon breast, Daylesford organic carrots, edible flowers and shiny coffee-flavoured dots that stuck to the plate like icing. The white kernels on the plate are last season’s dried apricot kernels (to be consumed in moderation, of course). The pigeon was full of flavour and went particularly well with the carrot, and the little bit of wrapped foil was a very cute touch. After a palate cleanser of celery granita, the next dish was pork cheeks and crispy ear "cooked for a very long time", salmon roe, parsley root, wood sorrel and crumbled wasabi peas. 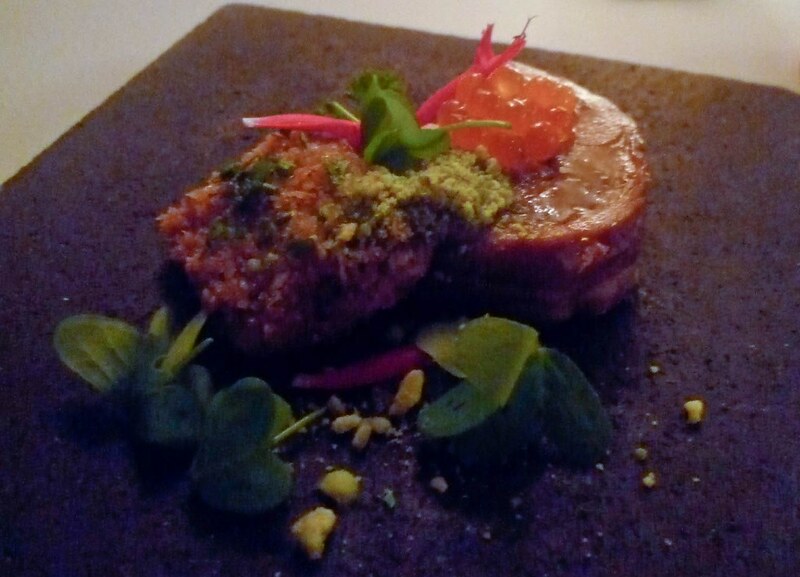 Totally unctuous pork, and the unusual pairing with the salmon roe kept you on your toes in the texture department. Next was the Jacksons Creek rump cooked sous-vide until perfect, served with a rich scoop of potato and yoghurt cream, toasted malt brioche crumbs, celeri rémoulade (my favourite French salad!) and a Thermomix-ed watercress and lentil coulis. The beef was followed by an excellent cheese platter (which included more house made bread studded with sultanas) and then we were brought the first dessert: "taken on the idea of a snow ball... soft meringue, rhubarb cooked with elderflower, almond gateau, white chocolate". 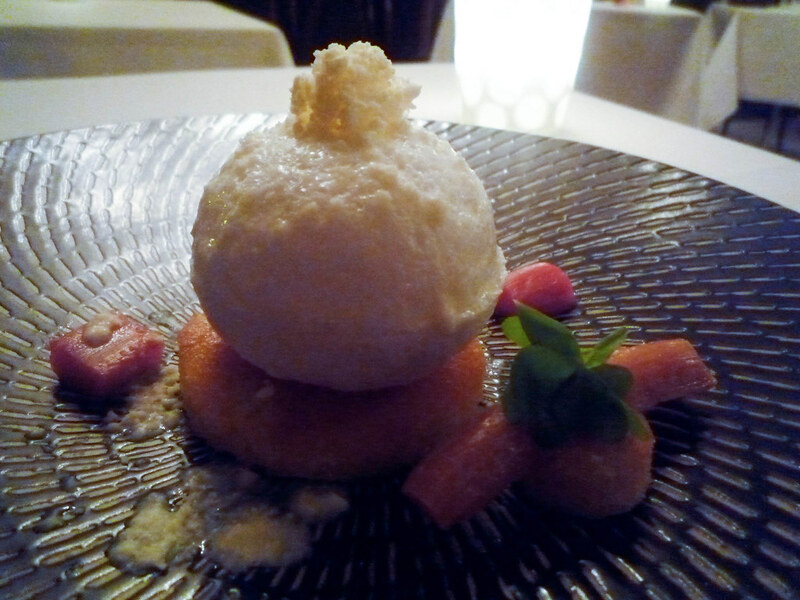 The meringue had a decadent texture and was a great match for the slightly tart rhubarb. The final dish, which Nic brought out personally, was another I'd had the opportunity to sample previously: chocolate mushrooms (meringues with hazelnut parfait caps) on a chocolate crumb forest floor with tuile twigs and leaves and a sorrel and mint granita moss. BEAUTIFUL and DELICIOUS. 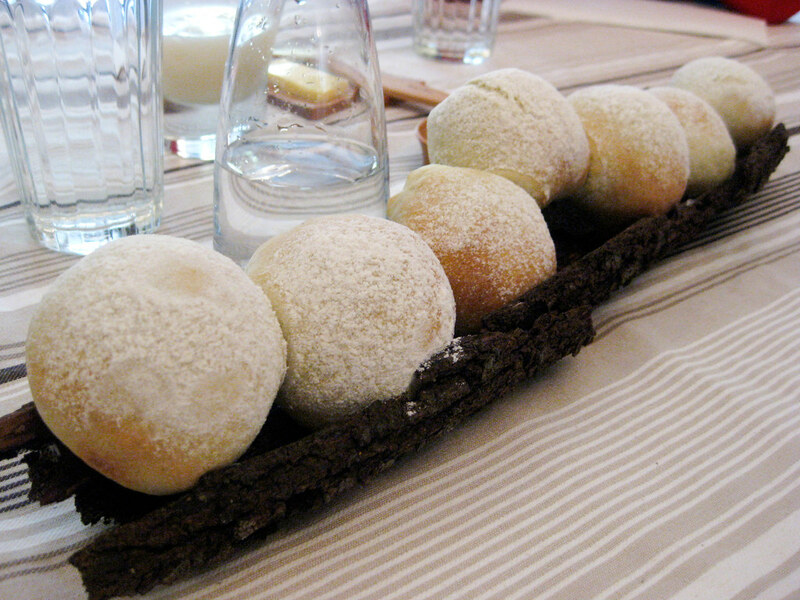 Nic has just this week revamped the Embrasse menu, and I am relieved to see that this dessert survived the cut! It was a sensational dinner, both A and I loved every dish. Ah, but the other side of Embrasse that I also want to show you is the Sunday lunch, a relatively recent innovation. 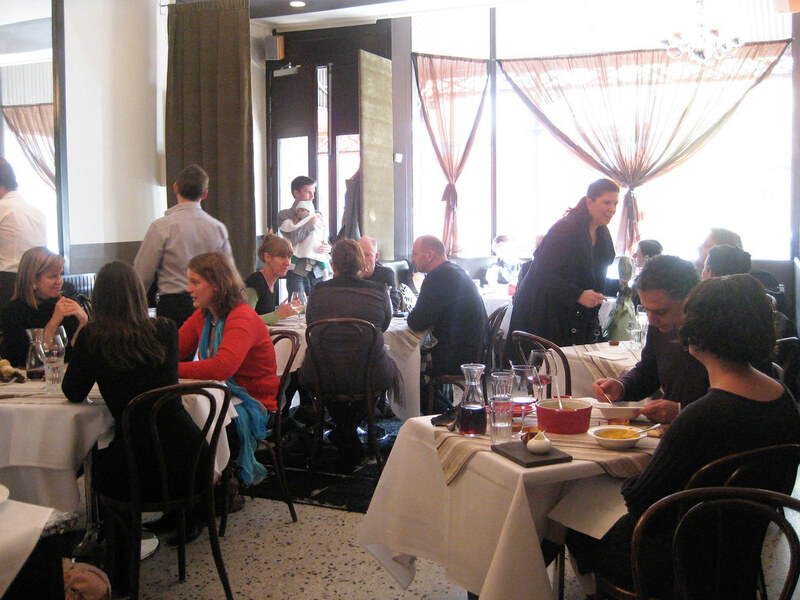 For $62 a head you get a four course French rustic lunch, served communally according to your table size. 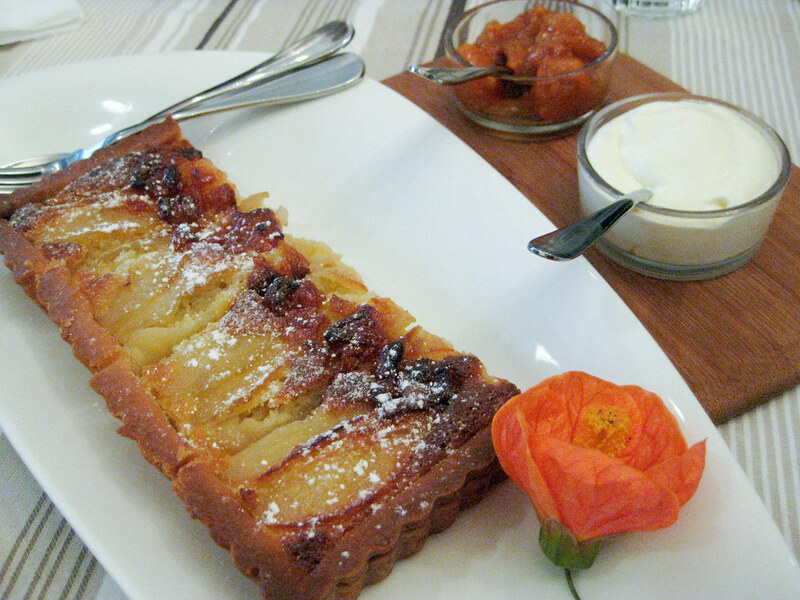 The week after my degustation with A, I went back to Embrasse with three girlfriends for a cosy, casual Sunday lunch. Having been to a somewhat wanton 30th the night before, I arrived feeling wretchedly hungover and subdued. Camm sized up my condition and decided to prescribe a glass of pastis - STAT! - to send me on the road to recovery. Whaddya know, it worked and I was soon chattering away and able to enjoy the delicious lunch we were served up. 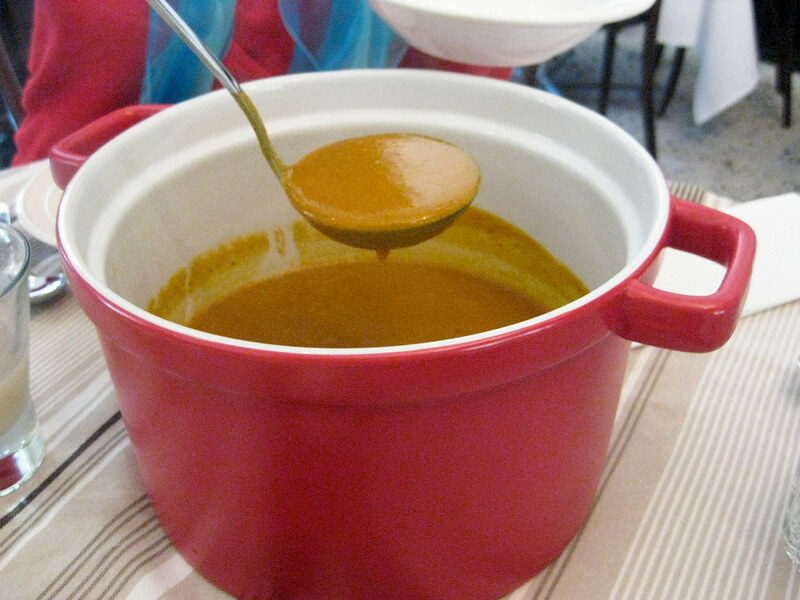 The soup course was pumpkin and pine mushroom soup, made according to Nic's mother's recipe. 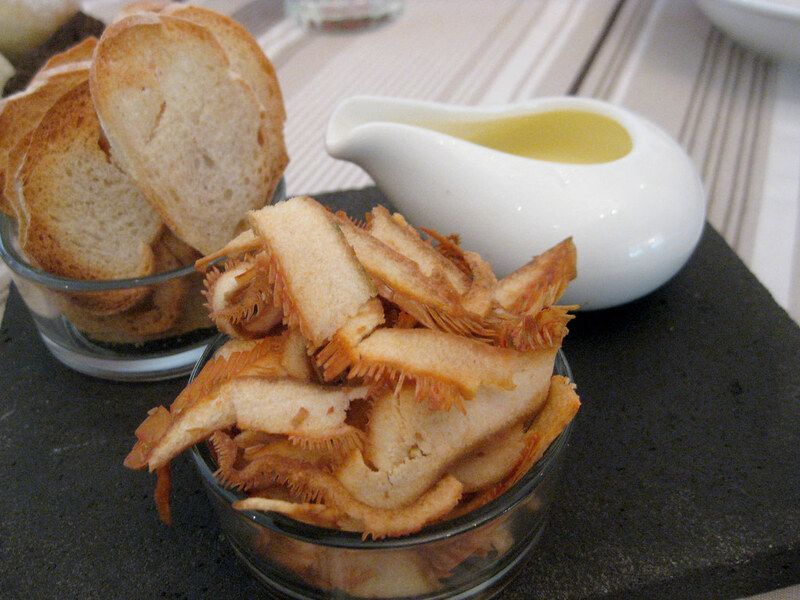 I loved that the bread rolls accompanying the soup were stuck together and arranged on a curved piece of bark, and that we were given a serve of shaved pine mushrooms and a jug of cream to add if desired. The soup for our table of four arrived in a communal pot, which we ladled out between us. 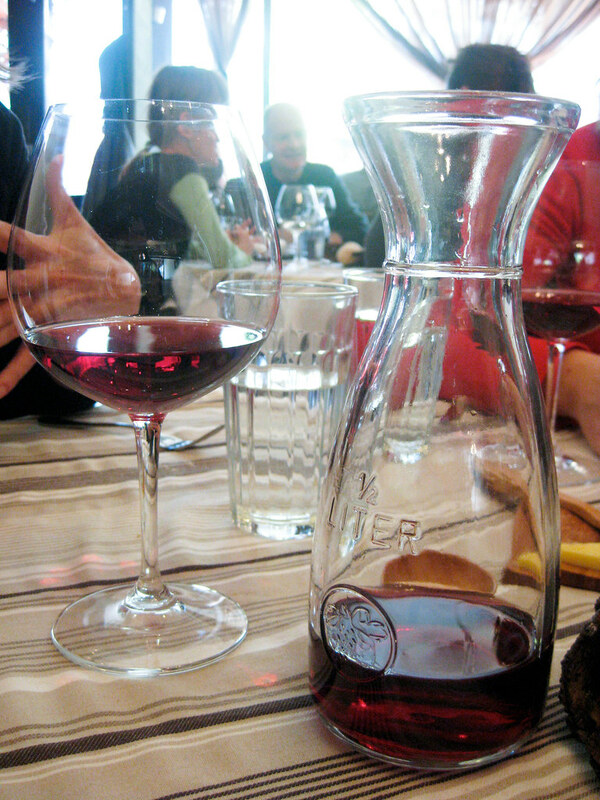 For the Sunday lunch, wine is offered in 500ml carafes for $19. 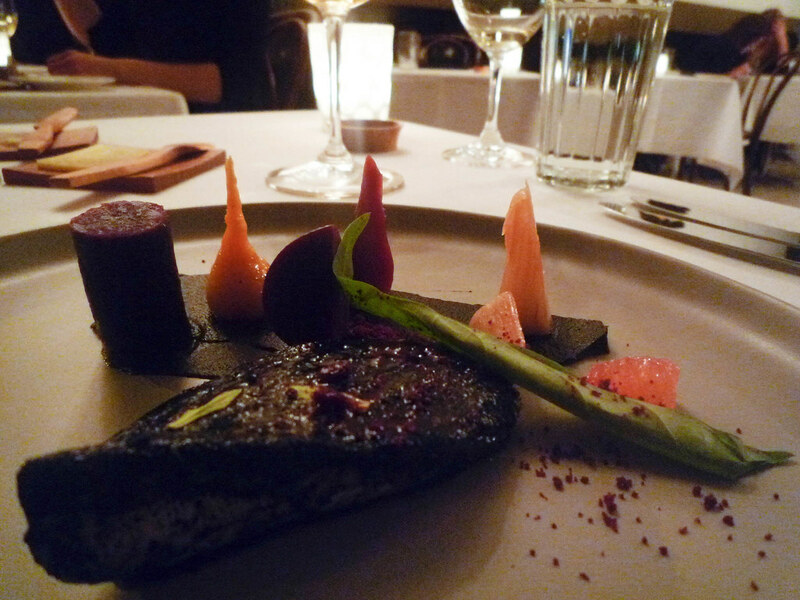 The salad course had a base of burghul, buckwheat and green lentils. 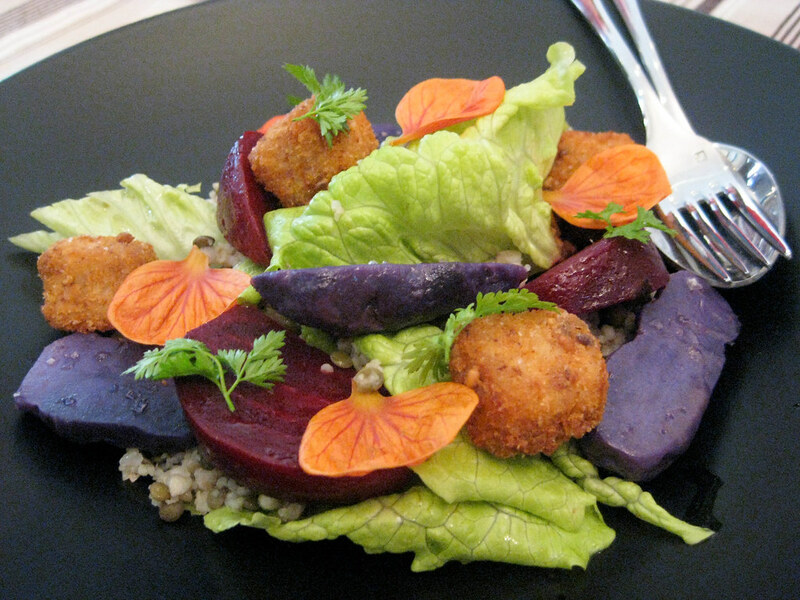 It also included little nuggets of crumbed pork belly and the most vivid purple potatoes I'd ever seen. 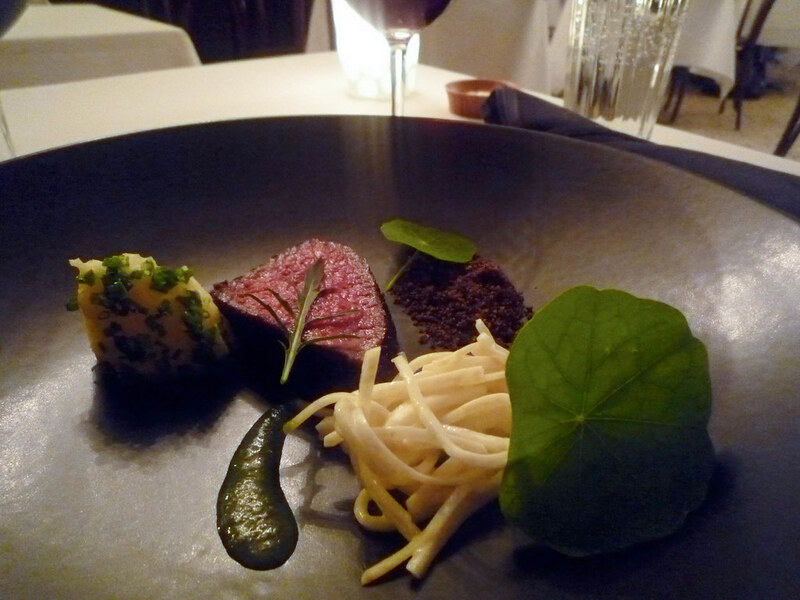 The meat course was a whole roasted wagyu rump cap from Jacksons Creek, with a jus gras. 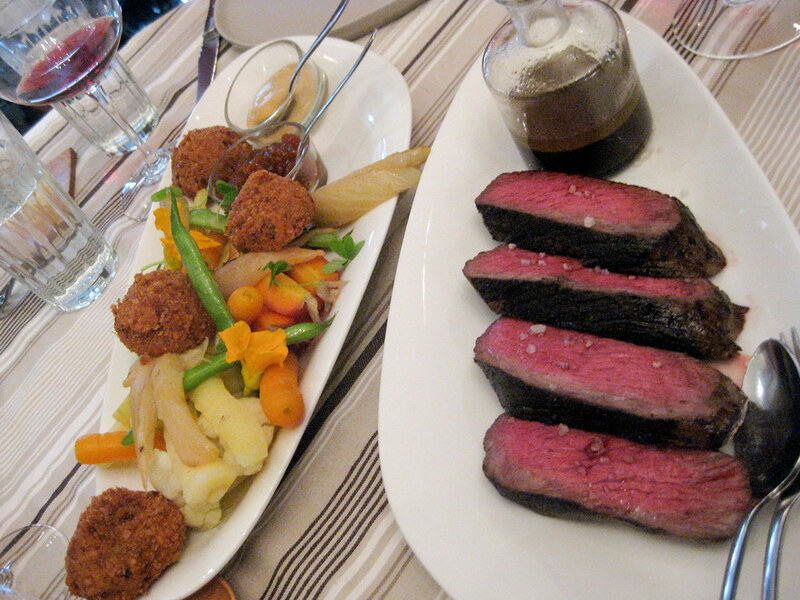 There was also Dijon mustard, relish and a side serve of heirloom carrots, braised fennel and potato croquettes. Hearty fare. The dessert course, four pieces of pear and persimmon tart, was probably my favourite (though I do hate to play favourites): I think it's the butteriness of the pastry that did it. Added persimmon and Chantilly cream on the side. Such a nice way to spend a Sunday afternoon! I'm keen to get a big group together and head back there for another Sunday lunch soon. 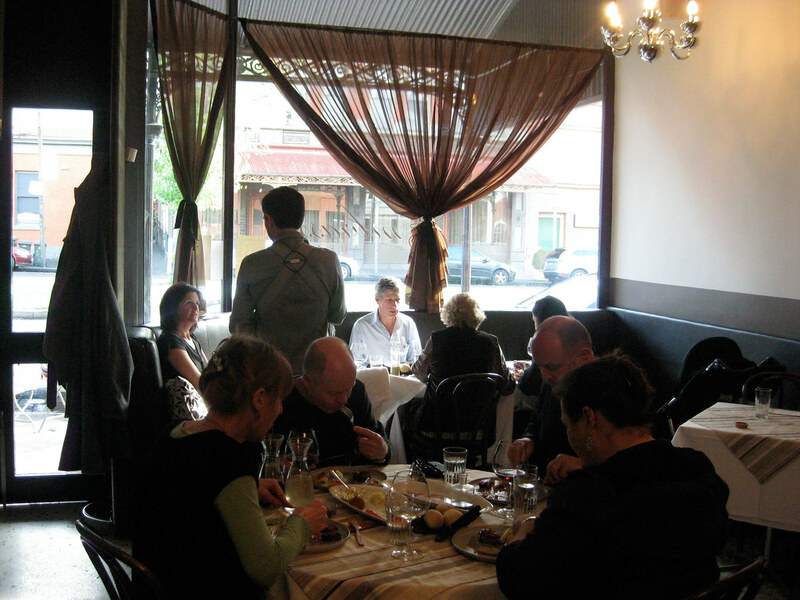 Oh, and if you're at a loss for what to do next Wednesday to celebrate Bastille Day, I heard through the twitters that Embrasse will be holding a special French traditional banquet ($90 a head, see details and preview the menu on the Special Events page of their website). "méli-mélo" - c'est tres chouette, n'est-ce pas? The Laguiole cutlery is the sort of thing I would put on my wedding registry if I actually believed in marriage. So, so gorgeous. Pastis sounds like an excellent hair of the dog, will have to try that sometime! It's edible art really isn't it? Such wonderful produce so beautifully plated. Good work Claire. Dinner & lunch - that's dedication. But worth the effort. Great pics again. Thanks for that. Hope you put more water in your pastis - that is not only hair of the dog, but will put hairs on your chest. Good that they have a selection of same. The SBS video from Tuesday (?) night is good too showing just how burnt those carrots have to be for the puree. Might have to spruce my post up if your readers start looking at my site. I absolutely adore your blog. I think the writing is superb, the photography is beautiful, and your passion is evident. I'm a writer and editor and used to be a blogger, and though I would just love to start a food blog like yours, I simply can't afford to eat out all that much. My question to you is, how on earth do you afford it? After all this luxurious dining and wining, are you a bit broke? Jo: Agreed. And it doesn't just look pretty: the flavours are amazing too! Jeff: Thanks. 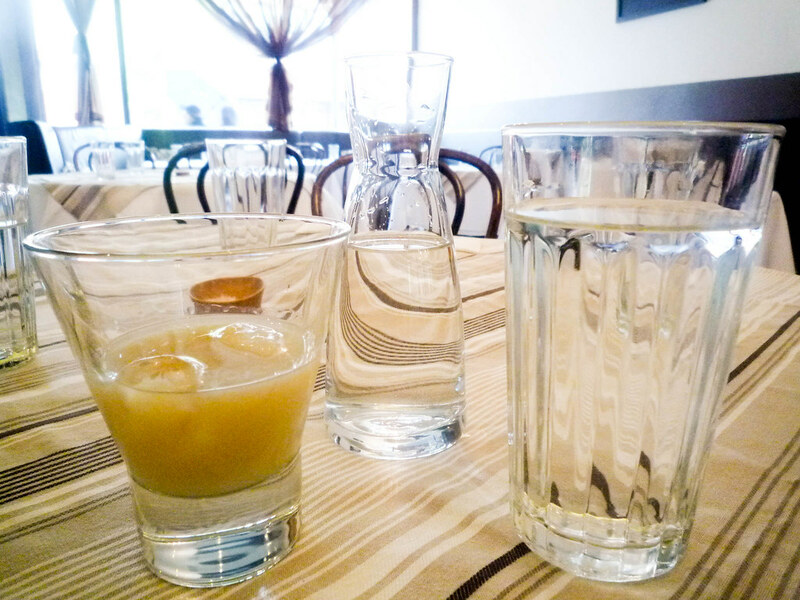 Don't worry, I put about a LITRE of water in that damn pastis - I hadn't had a pastis for about ten years, and I'd forgotten that the taste makes me shudder involuntarily... but it helped with my tender state. And yes I would love a Thermomix! It makes everything look so easy. But how much do they typically cost?! Gem #2: Thanks, glad you like the blog. To answer your question, well, um... I don't really know how to answer that question... I have a corporate salary... and for me and many of my friends, eating out at nice places is a favourite way to spend our discretionary incomes. Am trying to save for Europe at the end of the year though, so maybe you'll see a diminution in the frequency of degustations in the coming months! Did you see? Chef Nic linked this post on his twitter page!! Absolutely loved Embrasse myself when I went the first time (for the Sunday lunch)... beautiful!! Thanks Claire! I do hope your savings plan doesn't affect your blogging too much. I'm curious about your day job. Can I ask what it is that you do / which field you're in? Of course, I understand if you'd rather not say. 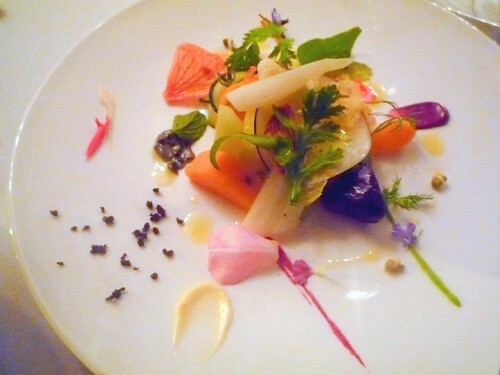 Gorgeous post, obviously a lot of love in his food, it shows on the plates & in the pics. Your pics were just beautiful. Ms I-Hua: Yes, I did see that. Thanks, and glad you liked it! Gem: No worries Gem. I don't broadcast it much on the blog, but it's also not a secret that I'm a corporate lawyer. As it turns out, there are quite a few food blogger/lawyers - I can think of at least three here in Melbourne! Karenmareeg: Thank you so much for your kind words and glad you liked the photos. I had a 30 day free trial of Lightroom when I uploaded these photos, which may explain any difference you may find in their quality. My girlfriend and I went here for our first anniversary (after I had tested it out with an Express Lunch during the MFWF. We both thought it was fantastic - intimate, quiet and genuine artistry in the food presentation and ideas. 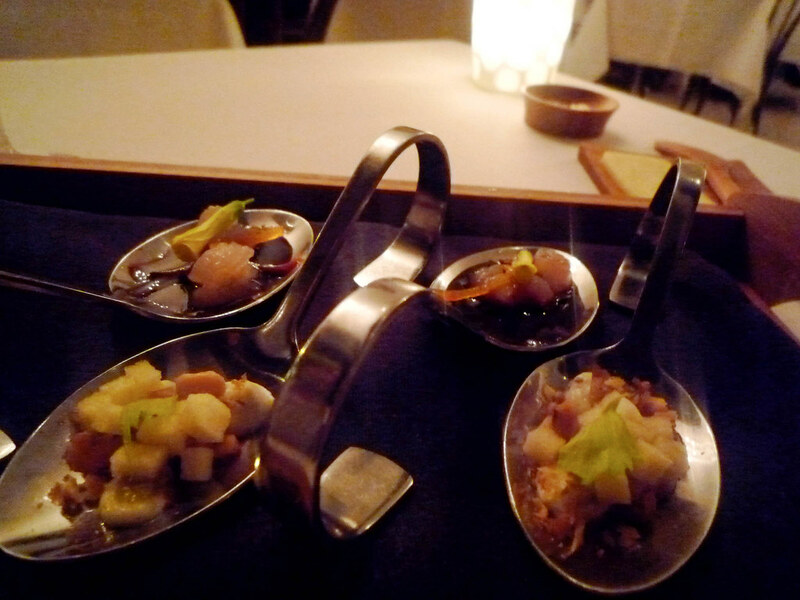 My girlfriend particularly enjoyed the fact that 25% of the eight course degustation menu was devoted to desserts! The measure of how enjoyable an experience it was is that I heartily recommended it to my even keener foodie friend. Any idea who the waitress is? She had only just started there when I went for the Express Lunch but I had a feeling I had seen her at another restaurant some time previously. I went to Embrasse for my 2 year anniversary dinner with my boyfriend. 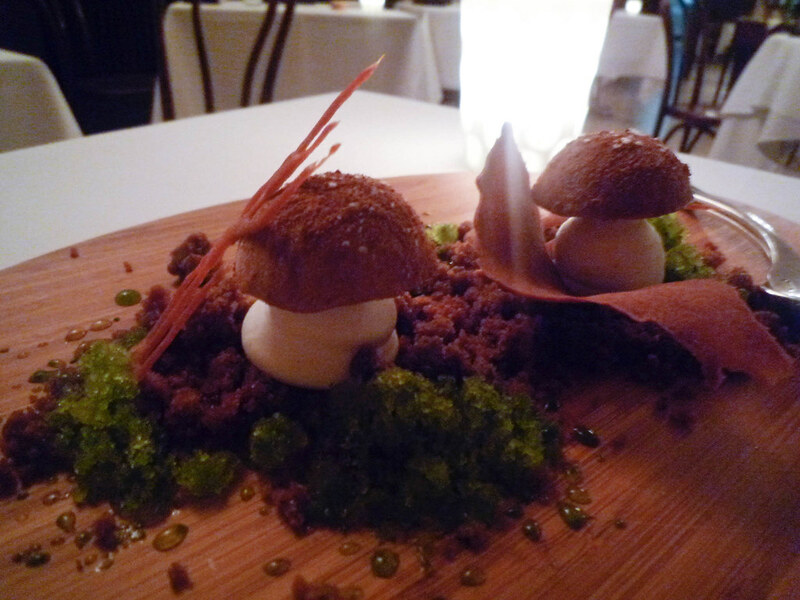 It was lovely, except that my chocolate mushrooms arrived with a hair embedded in the chocolate crumb forest floor. Not one to make a scene, I sort of just avoided it, but then told the waiter at the end. They offered us a complementary glass of dessert wine, but we'd had enough to drink by then, so they came back with the offer to not charge us for the champagne we drank at the start. All well and good, except that when the bill arrived it still featured the aforementioned champagne. By then we were a little over it, and, not wanting to spoil a special night, paid and left. Clearly, though, my memory of the incident is still quite strong, so the damage had been done. 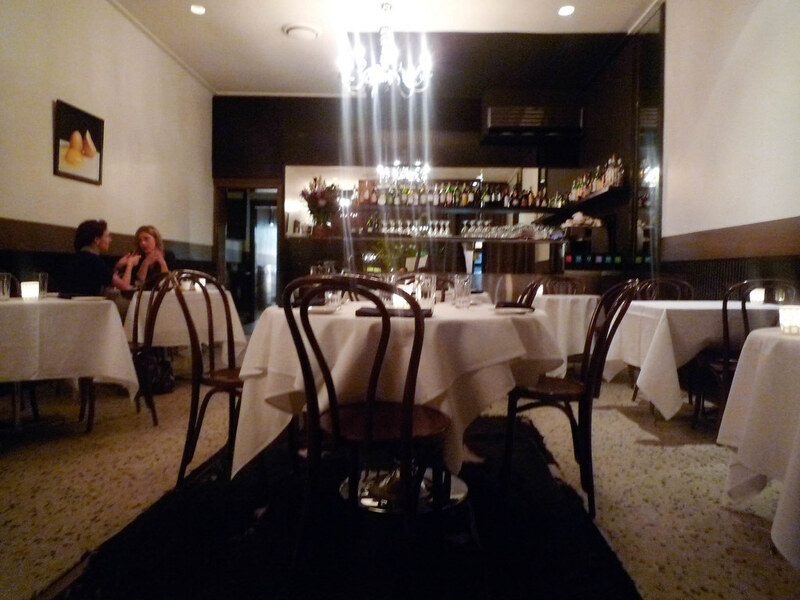 PS Claire - I ADORE your Google Map feature, and just used it to find a restaurant in Prahran for dinner tonight. (Mama Ganoush, FYI). Such a great little addition to the already well-referenced blog!